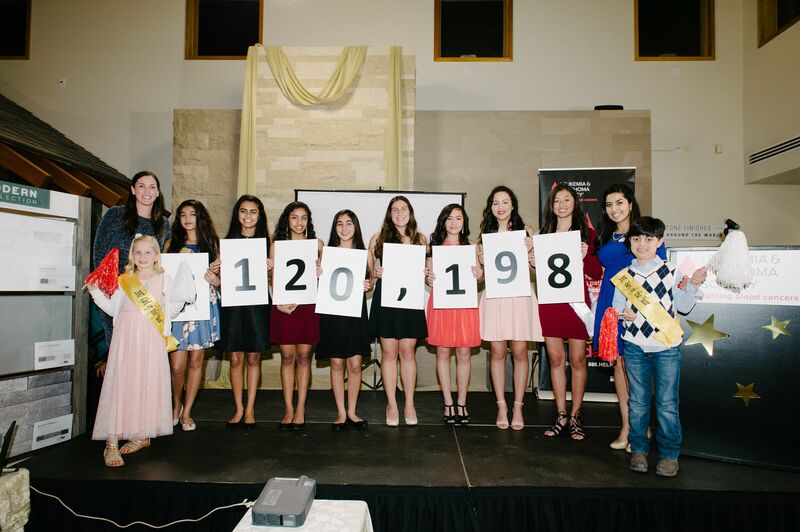 SAN JOSE, Calif., March 8, 2017 /PRNewswire-USNewswire/ -- The Leukemia & Lymphoma Society's (LLS) Silicon Valley & Monterey Bay Area Chapter hosted its first annual Students of the Year campaign. Exceeding all expectations, 6 candidate teams comprised of 10 extraordinary local high school students, raised more than $120,000 to help fund cancer cures. Megan Tsern from Los Altos High School was named Student of the Year. She raised more than $50,000 and received a $1,000 college scholarship. "I feel so blessed to have been a part of such an amazing campaign. Being able to donate $50,000 dollars to this organization in my brother's name means a lot. I'm so honored to be a part of LLS's mission to defeat blood cancer," said Megan Tsern of Team Cancer CUREsaders. Students of the Year is helping LLS make an impact on the lives of cancer patients. LLS is leading the charge in exploring new paths to cures and treatments, with almost 300 cutting-edge research projects underway, many in the promising new areas of immunotherapy and personalized medicine. Many of the treatments LLS has helped fund are now helping patients with other cancers and chronic diseases. Megan Tsern was awarded the Shooting Star Award, which recognized outstanding fundraising achievements by being the first to raise $10,000, as well as the Top Fundraiser Recognition Award, which links fundraisers who raise over $50,000 with one of LLS's Research Portfolios. The portfolios include a variety of projects that focus on specific blood cancer research. Candidates were recognized for their commitment to bringing awareness of the LLS Mission to the local community. The Mission Award, sponsored by Specialty Solid Waste & Recycling, went to team ProCURE led by Neha Mannem, Saniya Patel, and Spoorthi Vallamkonda of Lynbrook and Archbishop Mitty High School. "These students are an inspiration, they embody the notion that everyone has the potential to make a difference in this world," said Courtney Karnes, Executive Director of LLS's Silicon Valley & Monterey Bay Area Chapter. "What these candidates were able to achieve in seven weeks is truly amazing, and will have a tremendous impact on the lives of blood cancer patients and their families. We are humbled by their participation." This campaign also brought together the corporate community who supported these students and their efforts. The Presenting Sponsor was Argyle Data and the Inspiration Sponsors were Pete Moffat Construction, KLA-Tencor Foundation, National Petroleum, and Specialty Solid Waste & Recycling. Special Recognition was given to Lexus of Stevens Creek who received the Community Impact: Youth Empowerment Award. This award rewards a company and their commitment to the community by facilitating opportunities to empower our youth to make a difference in the fight against cancer. Our Future Leader Award was voted on by LLS corporate panel which included Argyle Data and Silicon Valley Bank. This award recognized an inspirational student who had shown strong leadership skills and was awarded to Megan Tsern. The Leukemia & Lymphoma Society ® (LLS) is the world's largest voluntary health agency dedicated to blood cancer. The LLS mission: Cure leukemia, lymphoma, Hodgkin's disease and myeloma, and improve the quality of life of patients and their families. LLS funds lifesaving blood cancer research around the world, provides free information and support services, and is the voice for all blood cancer patients seeking access to quality, affordable, coordinated care. To learn more, visit www.LLS.org.